A glass maker who works with other artists to fabricate artwork in glass. Charlotte Hughes Martin specialises in one off, bespoke work in blown, hand worked, kiln formed and engraved glass. Hand working glass is a very physical process as the work needs to be be carried, turned and repeatedly heated throughout and the material itself behaves in particular ways - for example it needs to cool down slowly and is not compatible with certain metals. This results in some practical limitations in terms of what can be made, but solutions can usually be found so it is best to get in touch to talk through project ideas at an early stage. Charlotte has been making glass for nearly 20 years, starting out as a glass blower and since branching out into engraving and kiln work. 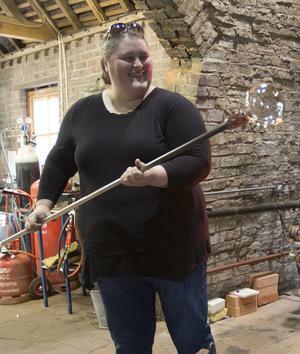 She has substantial experience of working for other artists and designers having spent time as part of the hot glass team at the National Glass Centre in Sunderland. She is based at the Red Cone Glass Centre in Stourbridge which is home to a number of other glass artists and designer makers and houses hot glass facilities. The Red House Glass Cone lies in the heart of the Stourbridge glassmaking industry. Built at the end of the 18th Century the Cone was used for the manufacture of glass until 1936 and is now one of only four cones left in the United Kingdom.